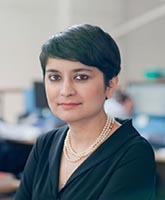 Shami Chakrabarti was born in Kenton, a suburb of the London Borough of Harrow. She studied law at the London School of Economics and was called to the Bar in 1994 before working for the Home Office. She joined Liberty, also known as the National Council for Civil Liberties, as in-house counsel in 2001, and has been Director since September 2003. Her first book, On Liberty, was published in October 2014. By campaigning through the media, lobbying Parliament, taking test cases and providing free advice to the public, Liberty challenges attempts to undermine civil liberties and human rights in the UK. Shami and Liberty are fighting to save the Human Rights Act from repeal and to end blanket surveillance of the entire population. LSBU student Judith said: "When I had just arrived in the UK in early 2000s, Shami was the face of human rights campaigns on UK television and an inspiration for me to look at the UK’s human rights achievements and failures. She was, and still is, a fearless voice in civil liberties issues." Nominated by Judith dela Cuesta, Year 3 LLB student and chosen for the Inspired by Law gallery of lawyers and legal campaigners in 2015. Photo kindly provided by Liberty.